Step into the reception of any mid-sized to large office and you’ll be greeted with a slick, considerately designed, well-lit space. You’ll most likely be invited to sit on a stylish, carefully positioned chair, help yourself to a drink from a state-of-the-art espresso machine and even charge your phone using a wireless charger. Go behind the scenes, however, and the set-up that company’s staff face on a daily basis can be a very different story. Messy offices, trailing cables, poorly configured workstations and outdated equipment are just some of the issues employees have to contend with—far from the swanky first impression presented at the front of house. Research shows that UK workers are some of the least satisfied employees in the world, ranking sixth in an international study across all industries, age groups and experience levels. Within the study, ‘feeling appreciated’ ranked highly as a way to improve job satisfaction for employees, an area that can be hugely affected by substandard working conditions. A further study revealed that the UK has one of the world’s least motivated workforces, finding that only 39% of employees look forward to going to work (most or all of the time). Less than half of the workers surveyed (48%) were engaged in their jobs, and almost a fifth (17%) were looking to change jobs within the next year. More than half (57%) of workers admitted to always feeling overwhelmed going to work, another issue that could be addressed by improving the office environment. Paying attention to employees’ happiness is one of the most basic yet effective changes employers can make in terms of boosting productivity. In most cases, improving working conditions doesn’t have to involve a massive overhaul, or a great expense. Filing away unused documents, containing trailing cables in under-desk cable tidies and clearing walkways of clutter will instantly give the workplace a more welcoming feel and make tasks more manageable. Giving the walls a fresh lick of paint, deep-cleaning carpets and replacing shabby or dated furnishings will give even the weariest-looking office a new lease of life. Although businesses may put considerable expense into client-facing areas, continuing colour schemes and styles of pictures and plants into ‘back of house’ areas—but on a smaller budget—can have the same positive effect. Squabbling over plug sockets or risking eye or neck strain due to poorly positioned monitors is never going to help productivity. Desktop power modules make it much easier for employees to charge their devices, or, if hot-desking, to ‘plug in and go’. Easily adjustable monitor arms and sit-stand desks improve posture and help relieve the inevitable strains from sitting at a desk all day. Wireless phone chargers, break-out areas that enable staff to escape from their desks, and coat hooks to keep jackets out of the way will make a huge difference to how employees go about their jobs in the workplace. Even simple touches like matching cups, potted plants and designated storage areas for personal property will work towards improving staff morale. How do you think office décor affects concentration and motivation? Office décor, colours, smells, air quality, workspace design and space all affect concentration and motivation much more than people know. For example, some colours are more conducive to creativity (yellow) while others (blue) help to support focused, individual work. Some of the world’s top-performing companies joined the dots between workspace design and workforce effectiveness a long time ago. For example, Google and Apple are major advocates of digitally enabled, collaborative and innovative workspaces that help to attract and retain top talent. Do you believe clutter around the office has an impact on headspace? They say a cluttered workspace leads to a cluttered mind. For me, that’s 100% true. Just having a mobile phone in your line of vision is said to create stress and distraction. The typical office environment can create a sensory overload. What techniques could you recommend to help employees think clearly in a cluttered or chaotic workplace? Creating clear space at your desk is a really effective way to minimise distractions and support focused thinking. Practicing mindfulness is also a brilliant way to train your brain to stay calm and centred. It’s really important to be able to organise your work in a structured way that is easily searchable. Tools such as Trello and Asana are great for consolidating tasks, thoughts and projects digitally while simultaneously reducing physical paper clutter. The majority of office-based workers are ‘knowledge workers’ who function best in different settings depending on the type of task they are doing. Administrative, operational, technical and strategic activities each demand a different workspace design for optimal productivity and performance. A lot also depends on individual preferences and working style. For example, if you really need to concentrate and get something done, go to a coffee shop or section of the office that is clutter-free, quiet and free from distractions. For brainstorming, a colourful and energising environment will do the job nicely. A good trick is to mentally associate different working areas with different types of work—this enables your brain to make connections and be more productive in each environment. 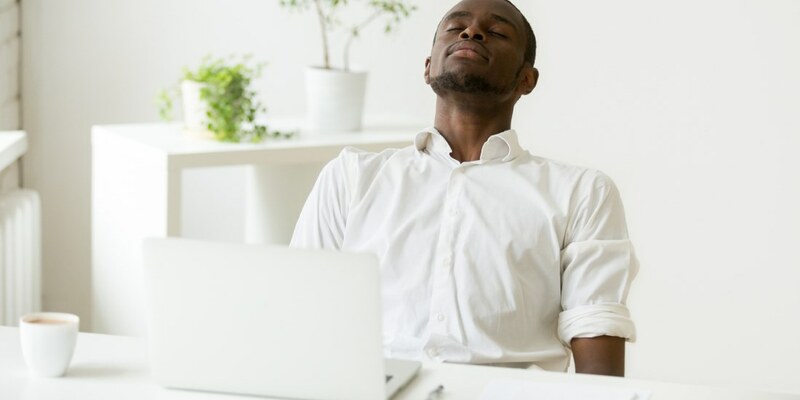 For example, allocating a quiet spot away from your usual desk so you can plough through your inbox means you can create defined boundaries for working on this activity. When you return to your desk, you can associate this location with getting tasks done rather than feeling the urge to check emails. Some offices have a slick reception area but are shabby behind the scenes. Do you think this has an impact on staff morale? Neglected workspaces definitely affect productivity, engagement with colleagues, morale and stress levels. Think of the office-worker experience like checking into a nice hotel. You expect it to be fantastic because the foyer is stunning, only to find that your room is old, stuffy and in need of refurbishment! Clients and customers are important, but you need to start with happy, engaged employees who will then deliver exceptional customer service. So, it makes sense to invest in your people first and foremost, and definitely not send the message that they are a lower priority. How could employers address this? An inviting office environment makes employees feel valued and excited about work. Break-out spaces, lounge areas, coffee spots and booths encourage collaboration and more informal interactions. This helps to strengthen working relationships and enable employees to get to know each other a little better. Companies at the cutting edge of workplace design are incorporating wellbeing features into their offerings—everything from stand-up stations to treadmill desks and meditation rooms are gaining popularity. As Richard Branson says: “Clients do not come first. Employees come first. If you take care of your employees, they will take care of the clients.” Simple! Are there any elements you would recommend incorporating into the office décor to improve productivity and wellbeing? Never underestimate the benefits of plants. They not only create a more attractive working environment while oxygenating the air, but some species even work to filter out pollutants and indoor toxins. Moreover, plants promote a sense of wellbeing and calm, by reintroducing nature into an otherwise clinical and technological world. I think it’s hugely disappointing when organisations think it’s sensible to cut costs by removing plants. The loss in wellbeing, productivity and employee engagement far outweighs any cost savings. We’re bombarded with so much noise these days, so quiet zones are essential for contemplation, reflection, recharging or focusing on individual work. These are areas free from chatter, loud phone calls, clutter and socialisation—designed entirely to allow colleagues to get on with tasks and think without any distraction. Do you think having accessible power sources, such as wireless charging or desktop sockets, will help reduce stress and improve motivation? More convenient and effective technology will definitely help to support productive working, as people will save time and be able to get on with things in a more flexible manner. It’s also important to create tech-free zones where workers can escape from the highly charged office environment and really switch off. Meditation zones and calm spaces to clear the mind and encourage relaxed thinking are a great way to promote this. Companies can easily fritter away their profits on sick pay and recruiting new staff simply because they fail to invest in their existing employees. Applying the same attention to detail to the current workforce as is devoted to attracting potential new clients will go a long way to improving staff morale and wellbeing—which in turn increases productivity and discourages employees from leaving. Not only will this save companies a considerable amount of money, it will also help ensure a happy and motivated workforce.